Jamie Marich, Ph.D., LPCC-S, LICDC-CS, RMT is the author of Trauma Made Simple: Competencies in Assessment, Treatment and Working with Survivors (PESI, 2014), EMDR Made Simple: 4 Approaches for Using EMDR with Every Client (PESI, 2011), and two other books on trauma recovery. Marich began her career in human services working in humanitarian aid in Bosnia-Hercegovina from 2000-2003. Jamie's journey with EMDR began as a client in 2004, and she's offered EMDR Therapy as a clinician since 2006. An EMDRIA Certified Therapist, Approved Consultant, and Continuing Education Provider, Jamie was the EMDRIA Research Poster Award Winner in 2008 for her qualitative research on EMDR and addiction. Jamie's doctoral dissertation on the use of EMDR in addiction continuing care was published in Psychology of Addictive Behaviors, a major APA journal. 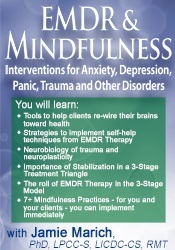 As of 2015, Jamie and her training company (The Institute for Creative Mindfulness) are providers of EMDRIA-Approved Basic Training Courses in EMDR Therapy. Financial: Jamie Marich is the Founder/Director of Mindful Ohio and The Institute for Creative Mindfulness. 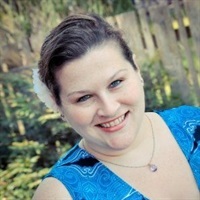 She receives royalties as an author for PESI Publishing and Media. Dr. Marich receives a speaking honorarium from PESI, Inc.